Put aside the quibbles over limited storage and don't even start down the route that the Nexus 7 is an iPad competitor – because this gorgeous little tablet has every chance of being a roaring success because of its ultra-low price. At $199 or £159, the Google Nexus 7 is pitched at pretty much the perfect price point – it's attainable tech: cheap enough to buy a loved one as a present, cheap enough to pick one up on a whim and easily good enough to bring a huge amount of joy. Amazon delayed releasing its bargain-basement Kindle Fire tablet outside the US, and may now find its potential market shrinking rapidly after Google announced that the Nexus 7 would be available in July not only in its home territory but also the UK, Canada and Australia. And, specs-wise, the Google Nexus 7 is a vastly superior beast boasting a quad-core CPU, 12 cores of graphics processing and a design that we can honestly state feels anything but cheap. For a price point coming in below $200 and less than £160, this is a tablet with an entry-level price but a host of high-end specs and Google-fuelled goodies. Although there is no confirmation, you would assume that the reason Google can produce its tablet so cheaply is that it is subsidising it in a manner similar to Amazon or games console manufacturers, in the knowledge that purchases on Google Play will turn the project profitable. It's a tried and tested model – and when you mix that with what looks like a really quality device, you can expect consumers to flock to it. Indeed, if you trace the rise of ereaders, you can point to the moment that Amazon got its Kindle at almost exactly this kind of price-point as the moment that cracked the market. Of course, once you hit a critical mass of consumers the world is your oyster, something that Google is well aware of. 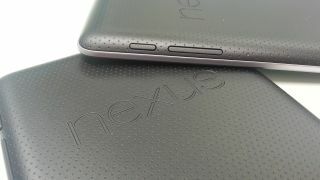 As more and more Nexus 7 tablets appear, awareness grows and suddenly you have a potential smash hit. In the tablet market you could make a case that the premium end of the consumer market is all-but sewn up by the wonderful but pricey iPad; millions of people who are now locking themselves into Apple's ecosystem with their music, movies and, to a lesser extent ebooks. The Microsoft Surface is an interesting addition, but is expected to come with a premium price and may well appeal to a more business-focused audience despite its impressive strides in terms of the consumer-friendly Metro interface. So to come in at the bottom end and start to lock up a thriftier and potentially much larger market makes a lot of sense for Google – especially because you can then make a bid for a share of the more premium market as those customers begin to aspire to more expensive products. The Google Nexus 7 may not be perfect, but at £159 and $199 it is definitely great value for money, and more importantly, that value is at precisely the right spot to lure in a huge number of customers.